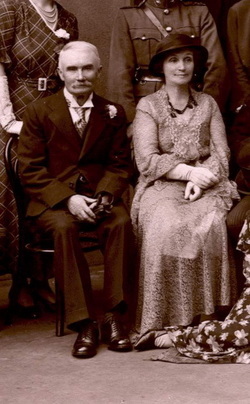 The couple had three sons who joined the Irish Free State Army. They were posted around Ireland so they were not in a position to look after their elderly parents. Consequently, Gerald took in his niece, Eithne O'Brien, nee Fennessy, and her husband George, to care for Delia and himself. Delia, who was regarded as a kindly and refined lady, had contributed with her fine singing voice to regular concerts in Clonmel. She was committed at a late age to Clonmel Asylum where she died of chronic interstitial nephritis 26th February 1947 aged seventy-eight. Gerald left 1 3 Mary Street following Delta's death to go to live with his sister, Mary (Dolly) Fennessy. However, Gerald proved to be a bad patient and Dolly could not, or would not, look after him any more, and so it fell upon his eldest son, James, to resolve the situation. James had been demobbed from the Army and he was now working in Dublin in the Civil Service. James drove to Clonmel during the family crisis -his son Val remembered sitting in the backseat of the car, aged only twelve, with his sister Terry, and their grandfather, a small old white haired man sitting beside them. He recalled that there was an air of sadness about the whole situation. James organised accommodation in nearby Cashel. Gerald ended his days in Cashel County Hospital where he died in May 1948, aged seventy-eight. Gerald was buried in the family plot in the Clonmel Corporation Cemetery. Having looked after Gerald and Delia in their latter years, his sister Mary (Dolly) Fennessy, in the absence of a will, took over the house. The Byrne family maintained it was the family home but the house was rented on a weekly basis at £1 3s p/w from 1904 with a final quarters payment of £4 3s on the 25th Dec 1946, when Mary (Dolly) took in Gerald to look after him. However Mary took over the house and she subsequently left Gerald's family house for 42 years to her daughter, Eithne O'Brien (nee Fennessy). This caused considerable dissension between the Fennessys and the Byrnes and lasted even into the 1980's after my father died when f called to the house, I was met by Eithne on the doorstep but I was not invited in. Another time my father and I visited Clonmel and stood across the road from the house but he would not knock on the door. The family records seem to have been given to Kevin Fennessy ( who became Curator of the Clonmel Museum) and over the years some of them were given to my father and these formed the basis for his research. As late as 1983 I visited Kevin in his home outside Clonmel and he very kindly gave me the original lettter ( death certificate ) of Gerald of Arkansas posted from the US. to his wife Eliza c:1855. Perhaps there was more, who knows. G03 04 Mary (Dolly) Byrne, 1875 to 1955, aged 79, Married Thomas Fennessy. G03 05 Joseph Byrne, 1887 to 1881, aged 4. G03 06 Elizabeth Clare Byrne, 1881 to 1895, aged 14.